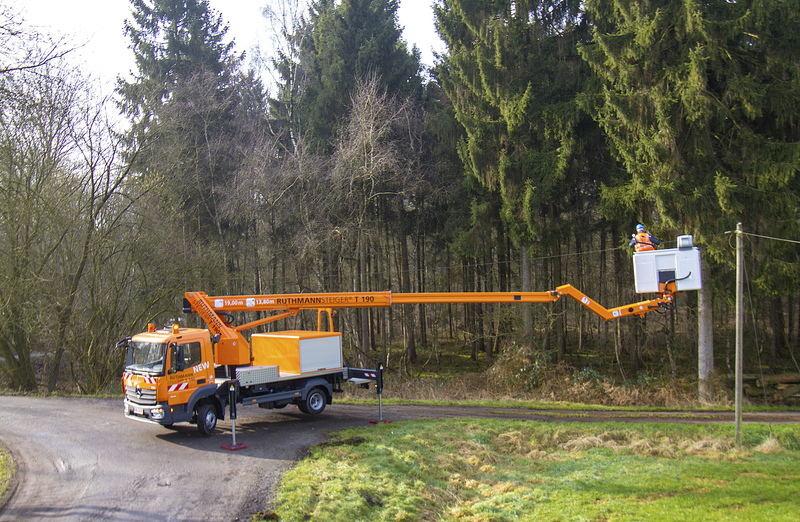 The T 190 has a working height of 19.0 m with a maximum lateral reach of 13.8 m, even at full (350kg) cage load capacity. The 2 x 90° rotating cage and 185° swivelling range of the jib -RÜSSEL ®- maximizes manoeuvrability in even the most difficult operating conditions. With its short 3.6 m wheelbase and total vehicle length of just 7.85 m, the T 190 remains maneuverable and versatile in even the most congested urban conditions. Municipalities, power companies, builders / contractors, and rental companies expect their STEIGER ® to be as versatile as possible. Diverse assignments include street light maintenance, tree cutting / pruning assignments, and installation work. 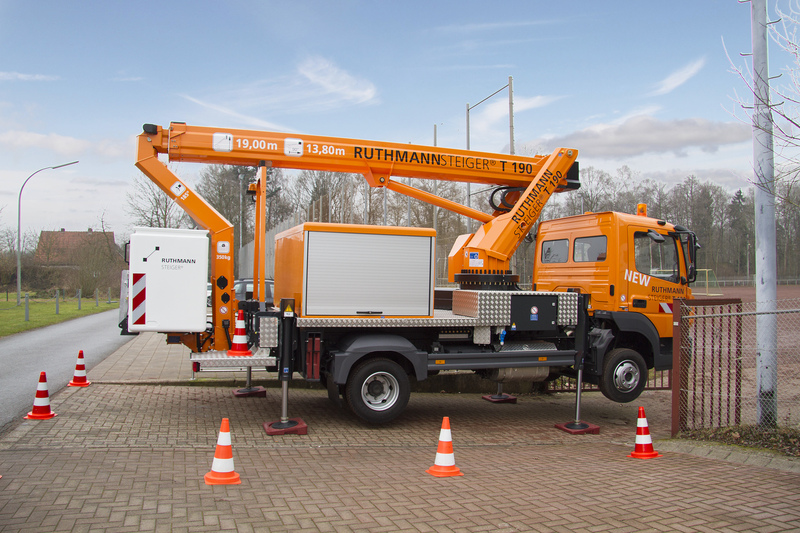 Our RUTHMANN STEIGER ® T 190 is the perfect all-rounder that is able to perform a wide variety of different tasks. 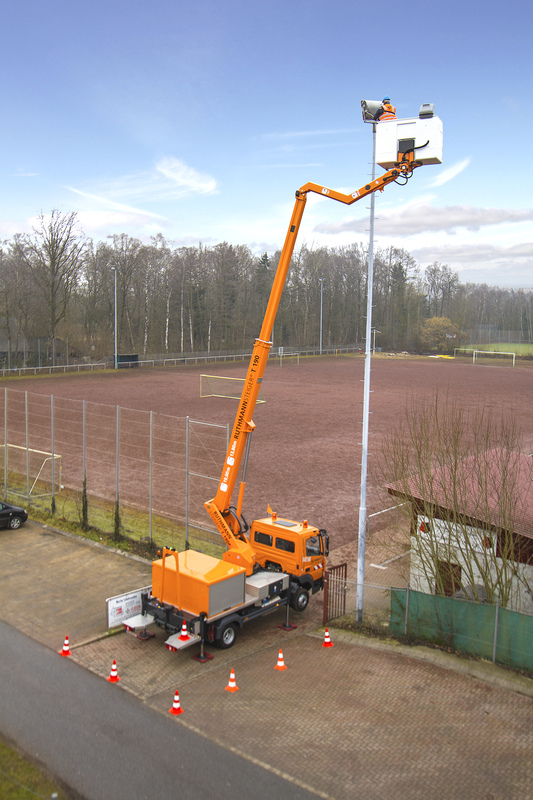 The T 190 has a working height of 19.0 m with a maximum lateral reach of 13.8 m, even at full (350kg) cage load capacity. 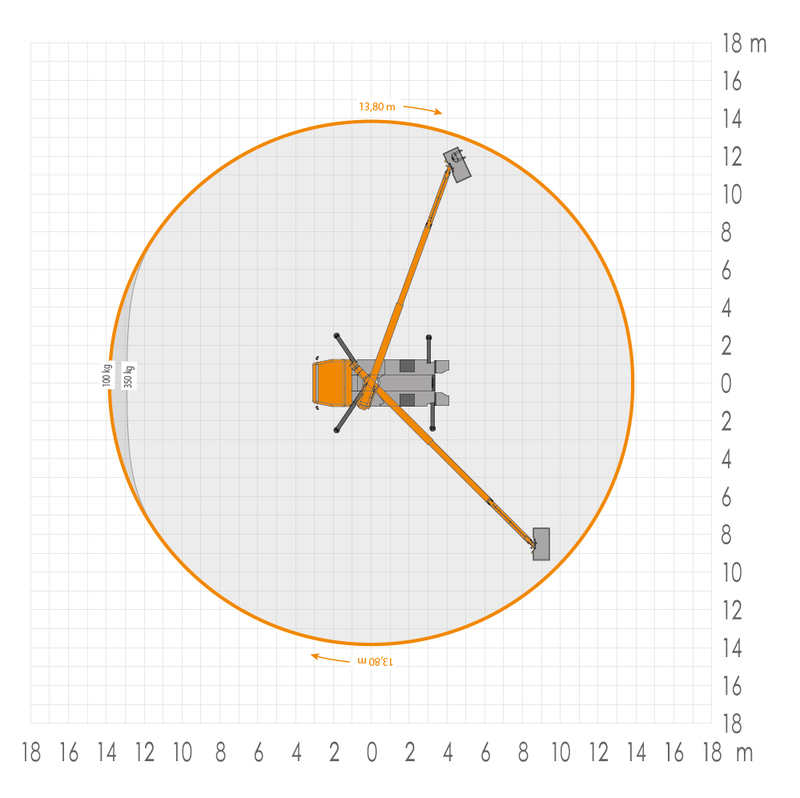 The 185° swiveling range of the movable jib (RÜSSEL ®) provides maximum agility. Trees, buildings, and pipelines / cables are accessible in no time at all. necessary stability can also be extended within the contours of the vehicle so as not to impede the flow of traffic. Using the automatic range adaptation feature, the T 190 is able to perform brilliantly on sloped surfaces of up to 5°. The STEIGER ® T 190 comes equipped with a standard aluminium work cage. The rear-mounted work cage (1.7 m x 0.86 m floor space) enables one or more operators to reach the desired object conveniently and in the least amount of time. There is even enough room for tools and equipment. The standard aluminium cage has a generous 350 kg load capacity. The STEIGER ® T 190 can also be ordered with an optional double-insulated 1000 V synthetic cage – ideal for electricians working on live power lines. With the interchangeable work cage system (optional equipment) aluminium and synthetic cages can easily be switched at any time. 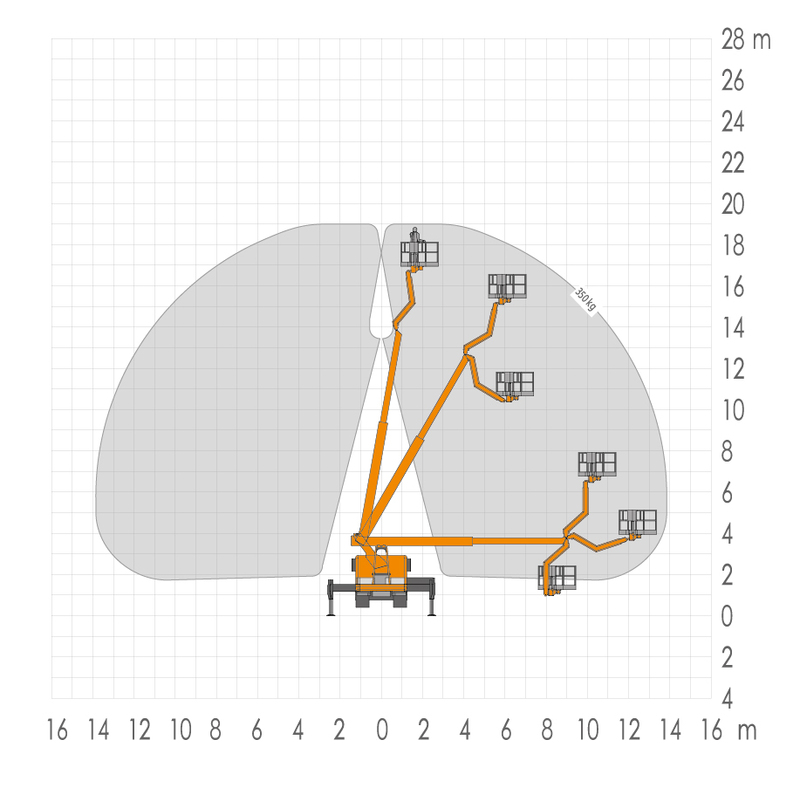 The 2 x 90° rotating cage and 185° swivelling range of the jib (RÜSSEL ®) maximizes manoeuvrability in even the most difficult operating conditions (e.g. tree cutting / pruning assignments). The standard automatic set-up / retraction mechanism saves an enormous amount of time. Because of the reduced set-up time, objects can be reached faster and work can be completed sooner. Once the job is done, the STEIGER ® T 190 can quickly return to drive position at the touch of a button. Overall efficiency is greatly enhanced at the jobsite. The STEIGER ® T 190 is extremely agile, has a wide variety of functions and is able to perform a wide range of different tasks. Contact us by phone, fax, or email to find out more about the many advantages and performance capabilities of our time-tested STEIGER ® products. We look forward to hearing from you.